Forbes Magazine has named Arizona the best state for future job growth, but one local economic expert said the distinction does come with some caveats. The Moody’s report projected a job growth rate of 3.1 percent through 2019. As the U.S. economy slowly recovers from the Great Recession, experts said Arizona has become a landing spot for expanding businesses because of its skilled workforce, available real estate and diversified economy. State and local officials recently announced several expansions into the state: Northern Trust Bank, Home Depot and Santander Consumer USA Holdings Inc. But the Forbes article and McPheters warn that forecasts can change quickly. For example, a blow to a major industry such as tourism in Arizona could significantly change the state’s prospects, as could competition from other states. Large companies headquartered in the Midwest and Southeast are expanding in the Valley and bringing plenty of jobs with them. Chicago-based Northern Trust Bank expects to add 1,000 jobs at its new Tempe operating center by 2018. Home Depot Inc., headquartered in Atlanta, will add about 800 jobs to its Tempe call center in an existing warehouse in 2016. Dallas-based Santander Consumer USA Holdings Inc., a consumer finance firm, plans to hire up to 970 employees at a new facility in Mesa, according to the Greater Phoenix Economic Council. Even McDonald’s plans to hire 2,000 people during a job fair on Wednesday. Home Depot spokesman Matthew Harrigan said CEO Craig Menear saw the Tempe center as opportunity to build on the company’s retail presence in Arizona. In an increasingly service-based economy, Tempe Online Contact Center Director Bill Parhar said large retail stores like Home Depot need to accommodate a growing online customer base. “Arizona has always done well in attracting call centers,” McPheters said. Companies like General Motors, which opened an IT center in Chandler in September 2014, are bringing higher-wage jobs. A GM software developer in Chandler makes $77,000 on average, 16 percent more than the average GM salary, and $10,000 more than a typical software developer earns, according to Career Bliss. GM Chief Information Officer Randy Mott said the opportunity to hire coders and engineers from universities in the region helped sway GM officials to move to Arizona. The expansion will bring 500 more jobs to the center by 2018, in addition to the 500 already hired, officials said. Arizona’s job outlook has been in large part shaped by a steady influx of baby boomers retiring to the desert, McPheters said. McPheters said the Valley’s combination of available infrastructure and a talent pool of young college graduates also work in the state’s favor when companies look to leave an economic footprint in Arizona. That availability of college graduates incentivized Home Depot’s expansion. GM officials also cited the educated workforce as a plus. 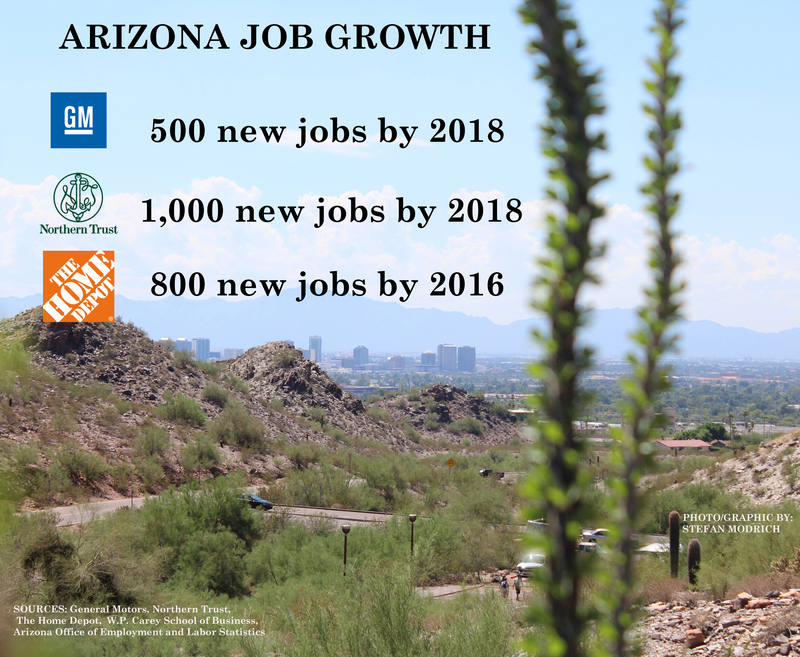 Another reason Arizona has become a popular option for companies looking for presence in the West is the outreach and involvement from local civic groups like the Greater Phoenix Economic Council and Arizona Chamber of Commerce, Parhar said. The Phoenix Mountain Preserve is one of several open space parks in Maricopa County which facilitate economic activity in the communities they serve. While Moody’s projected to lead the U.S. in job growth in 2016, Arizona had the 10th-best job growth rate in 2015, according to the Bureau of Labor Statistics. Arizona’s neighbors – Utah, California and Nevada – were ranked higher in 2015, according to the bureau. McPheters said future projections may not account for competitive growth from other Western states. Utah is attracting high-tech jobs, and like Arizona, isn’t dependent on energy like Texas, whose growth subsided with falling oil prices and lessened demand, McPheters said. In Arizona, however, the unemployment rate, at 6.3 percent as of September, remains higher than the national average of 5.1 percent and has continued to increase since May. 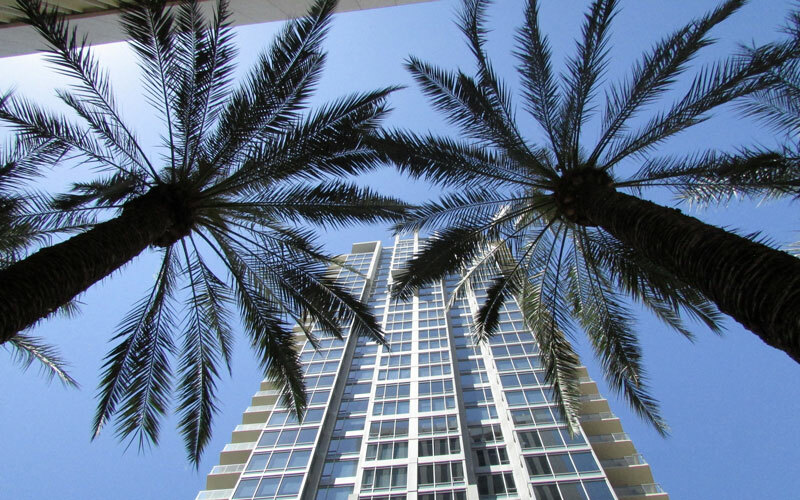 Post-recession, the Arizona housing market prospered, but if the Federal Reserve raises interest rates, housing prices could be affected, he said. There’s also competition from Oregon and Washington, which had higher job-growth rates in 2015, according to the Bureau of Labor Statistics. But McPheters said the progress Arizona has made is encouraging to both local and regional businesses with an eye on expansion opportunities.